Great article. I agree that the ad does remind us not to always assume the worst. That being said, come on. Really? Most kids (and adults) who are engrossed in their screens are not doing so in order to create sentimental montages for their family. I’d say…98% of people are not doing that. And even if they are, I’m still not convinced that they wouldn’t have been better off really in touch with the moment instead of capturing it for later. Thanks again. Using the phone/camera shows interest, engagement, curiosity and involvement. I’ve heard this same claim applied to food. Just because I took a photo of it doesn’t mean I can’t eat it. Yes, it definitely can enhance when used with purpose and reflection. My concern stems from being completely engrossed in the camera that the other senses are missed – smells, sounds, feelings, sights beyond the screen. Capture the moments but be reflective so we are actually the leading people in our lives rather than the camera person. I can relate. Last weekend I was watching my daughter perform in a circus. I was excited to see her…. I made the mistake of trying to capture some of what I saw on film to share with her (and others). My first few attempts were either blurred or she had passed out of the frame. At first I became frustrated because I wanted the shots. After one final (botched) attempt, I made the conscious decision to put the camera away and just focus on what I saw. I was able to enjoy the performance so much more and really focus on the whole event. It was the better decision on my part. For sure – I had the same thing last week. I was at my daughters’ dance show and I started to record the dance. I then realized that it was so dark that the camera couldn’t really capture it… and I also realized that by only watching my daughters through a lens, I was missing the emotion that a dance can bring about. Next time, I should work it out so a friend records our daughters’ dances and I record theirs. As ever in life it’s all about balance. It’s nice to get pictures to remember the moment. But for me the most important part is to live my life. To be present in the moment. I’d rather a fuzzy memory of a truly enjoyed moment than a vivid picture of a half noticed one. Yes – it does not have to be either or but more of an informed, reflective choice on what we capture. As you know, I have taken a ton of photos and videos over the years and I am thankful for this; however, since having kids and the accessibility of a phone, I seem to be looking more like the boy in the ad… and my wife seems to get to enjoy the moments while I capture them. Need to back up a bit to be in the moment more often. Thanks for commenting, buddy. Means a lot. That is so important. I would be the first to admit I am guilty of having my phone out far too much … and not for the utopian reasons Apple advertising would like us all to believe. But at the same time, capturing some of those moments to share with family and friends helps strengthen bonds that are already tight. There are many times a family get together is enhanced by conversation about a picture/video posted in social media of my kids Christmas concert or random funny act in the house. Also, with much of my family living on another continent, they get to feel connected to us and vice versa in a way that is more powerful than just phone calls. I appreciate you continuing to make me think and reflect about my own use of social media and mobile devices. Being connected has enhanced my life in so many ways but at the same time, I never want to cease to live in the amazing moments that can occur at any time. It’s all about finding that balance. I find I take a few pictures or a very short video and then I put it away. But from the other point of view. This summer my siblings and I had all our old home movies transfered to DVD. I am so grateful that my parents took the time to be behind the view finder and capture our childhoods. Granted, in the olden days the camera only came out mostly for vacations and birthdays, but I get to see my parents playing, singing and dancing with us. Moments in time that I would never of known about and have found so much joy in watching now, if my parents had put the camera down. I don’t remember my parents with a camera in their faces…It didn’t take away from my enjoyment of life. Our home movies are really a gift that they gave to us, especially now that my dad is gone. Now my kids are older and they too love to watch the videos of themselves when they were wee. So I guess for me, the gift to my kids of capturing their childhoods, is worth me witnessing them through the camera once in awhile. I find the balance that works for me, but I’m not really capturing these moments for myself, but for my kids and grandkids. This is a huge issue in the wedding photography industry. While those guests are so busy capturing the day via their phones, they are missing the wedding and the emotion of being in the moment. Will that father who was videoing his new daughter in law come down the aisle on his iPhone really watch that video again or will he later regret that he can’t remember the moment at all because he was staring at a screen? I am often behind a screen, via a camera or a phone. But when it comes to my family, I do remember something my Dad told me long ago, you don’t have to capture it all to remember it all. I know that Apple is trying to convince viewers that their product is necessary to better enjoy life. Putting the sales pitch aside, I put myself in the shoes of the teen character in the commercial. Teens can often be very egocentric and not think about the needs and wishes of others, especially their own family members. They often do what they want to do, when they want to do it. That is what we think we are seeing in this commercial, only to realize that the phone-toting teen was actually focused on those people around him for the purpose of creating something that will capture those happy moments. While he was not totally engaged in those memorable moments himself, he was able to preserve them for others and give his families members a taste of an experience that they may not have been able to do first hand. What I saw in this commercial was a juxtaposition of typical assumptions about adolescents. His actions that looked disinterested were actually him being very attentive and giving. Yes, I agree that it is important to be “in the moment” more often than you “record the moment,” but this commercial shows how technology can be used to be a tool for giving to others, rather than as a way to solely serve one’s own interests. At a concert this past summer, I whipped out my phone to capture a few seconds of video of Gavin DeGraw singing his way through the aisles in the crowd, and watched him through the screen walk right by me, within a few feet. I didn’t even reach out to shake his hand. His new song “Best I Ever Had” mentions how everyone in the audience is “looking at their phones”. Wondering if we are too busy with the tweet, the text and the tech to notice life and the living around us? This talk by Sherry Turkle – Being Alone Together, spoke to me in October, and continues to speak to others. You must have been tweeting Ms. Turkle, as you share the same sentiment. Dang it Chris, once again you say what I am thinking. I was recently at a concert and realized I was filming the song and missing it at the same time. Why do I need a poor quality recording of a song I have a good quality recording of? Be in the moment I tell the kids. Don’t ruin it by trying to take a stupid selfie. As a former wedding photographer, and someone who takes a lot of photos, I make an effort to avoid seeing the world only through the lens (or phone screen). This is evident in videos of my own kids in activities. Often the camera drifts away from them because I’m actually looking over the the camera, not at or in the lens. This to me exemplifies your point. I’d rather see it live than only ever see it on video, even though I was there at the time. 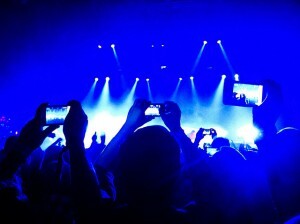 And still, I get caught capturing and sharing things when I’m actually missing further enjoyment or memorable moments. I didn’t retweet the video when I saw it. But I didn’t know why until reading your post… Thanks for sharing! Hi Chris. Another great post! We’ve all heard the line ‘A picture is worth a thousand words’. I’m sure most of us would rather view an image or video rather than read a written description. But what a video and to even a lesser extent an image cannot capture is the emotion of the lived experience. Taking photos and capturing video is a great way to include people who could not be present for an event. But if this means that as the photographer you are not truly ‘present’, interacting and sharing the experience with the children then not only are you sacrificing your only enjoyment, you are also limiting the children’s experience because they will lack the interaction with you. It is this lived experience and the emotions that accompany it that are critical to the formation of lasting memories on the part of kids. I’ve been on quite a tangent of late challeninging the Turkles of this world and the notion that tweeting, taking pictures, et al is somehow a lack of humanity and thoughtfulness. I’ve read several great articles lately that would argue that this is not a good vs bad thing but another way of experiencing life. You can check my Diigo account for the links. Certainly each one of us can be guilty of not being in the moment. Not because of technology but because we’re human and we screw up. I’ve rarely regret any if the 20,000+ photos I’ve taken ove the past several years as they’ve been wonderful ways to document and remember moments. I don’t try and tell people they should do it my way but they should so what makes sense for them. I wouldn’t even say this is about balance. It’s about choice and mindfulness. I realize you were thinking out loud here and focusing on Apple’s ad but I think sometimes the argument gets steered into us thinking certain behaviours are inherently wrong as opposed to understanding intent and purpose varies for each of us and there’s no rule book. Hey Dean – thanks for commenting and sharing the links online as well. To me, it is not an either/or black/white decision. I am so happy that I have captured many moments on video and photo. We look back already and smile when we watch previous photos and videos we have created. However, I struggle with what the ad is portraying; (as I said, we don’t know context but) I see a boy that does not look up from his phone while all of this is happening… and he is not filming the whole time (he is beside the people he is supposedly filming for example). I see ME in this ad. I have seen some great moments and instead of enjoying them, I have thought, “where is my camera”, gone to get it… then missed it. I just think our first priority needs to be live life with ALL our senses and also (2nd) capture them. Watch the ad – the boy sees the screen and nothing beyond and this is where I have an issue. I would have much less of an issue if he recorded snowman making and participated. If he hugged first, then recorded others. I agree with you that we need to challenge the Turkles of this world and that was not my intent to write from a Turkle angle. My intent was to reflect upon my own life and remind myself (which blogging often does for me) what the priority needs to be. I will still record and capture many, many moments of my life – but I need to remind myself that I do not need to capture it to enjoy it. I just keep thinking that if we spend too much time looking through a screen, we miss the other senses that surround us. The warmth of a hug, the smell of my grandpa, the gentle touch of a toddler… and the sounds that surround us. Not an either/or but a reflective and more purposeful AND. So not that we disagree… just wanted to be clear that this was more about reflection and purpose. Thanks again for causing me to further reflect and expand my thoughts. As I said in a tweet, I appreciate that you opened up dialogue on this, Chris. Like Dave, I also did not share the video. As I saw it, the goal of the ad was to promote a product, simply and ultimately. Sure, the emotion and message impacted me as well. I saw many others share and appreciate the video and that made me think and care more about the impact of the messages in it. I also had similar thoughts and concerns as you and Aaron and others here regarding how interaction would be affected with others as one is busy “capturing”. Like Dean, I also wondered what “balance” in this would look like. I wonder if the balance that each person would need in this might look different. One may be clear and confident about their choice but there is also the balance of considering that one’s choice may not be working for others. There seems to be a very impulsive aspect of capturing some moments too. It is so easy to do so now – which may demand more mindfulness, reflection, and self-regulation on all of us. Most importantly, here’s to hoping that you and your family have nothing short of the Merriest of Christmases! Know that I’m thankful for our friendship and hope that we cross paths time and again in 2014. As for this conversation, one of my greatest regrets having lost my dad a few years back is that I didn’t capture more of the moments that we shared together in some way. I don’t have any video of him at all and I have very few photos of him with my daughter — and that makes me sad because she’s forgetting him. He’s just a fragment to her — someone who she once knew, but doesn’t really know. Aren’t those missed opportunities — especially in today’s world where capturing videos and images is so darn easy to do? The compromise in my own life, by the way, is to have other people who don’t care quite as much about the moment do the capturing for me — and then doing the same for them when we are at events that mean more to them. For example, I’m the official videographer and photographer at birthday parties for my best friend’s kids. While I love them and want to be present in their moment, being behind the screen for the whole day doesn’t bug me because I know that it is freeing him up to enjoy the moment and because I know that he’ll do the same for me. I gave the kid some slack because I think in the end he was creating a new experience from the old. As we say to our kids, “Are you consuming or producing?” Because he was producing he had to look at each scene in a unique way and find a perspective that would convey some kind of message and link those together. So in the end, he might have been the only one actively involved in each scene. I am the unofficial film crew for my daughter’s team. Each week I set-up and watch through a tiny screen a performance far away. The video is simply so the team can watch what they do and break down their performance. I do feel like I miss what is happening each week as I never really get to just sit back and watch. The last performance I set-up multiple cameras and cut them all together. During that process, while creating a new product, I truly get a sense of the performance and appreciation for what they do.